Just how good is Shared Belief? He has hinted at potential greatness throughout his career, earning a championship title as a two-year-old and winning grade I races at distances from seven to ten furlongs. But honestly, Shared Belief seems to be getting better as he gets older, and the manner in which he won Saturday’s Santa Anita Handicap (gr. I) (VIDEO) suggests that he may indeed be a truly great horse. Guided straight to the outside by Mike Smith, Shared Belief tracked a moderately quick pace for six furlongs, then seized command from pace-setting Moreno and drew off under virtually no urging to win by 4 ¼ lengths. Had he been urged down the homestretch, there’s no telling how much he might have won by, or how fast he might have run. As it was, he crossed the wire eased up in the quick time of 2:00.67 for ten furlongs. Shared Belief’s next race will come in the Oaklawn Handicap (gr. II) at Oaklawn Park on April 11th, which will then be followed by a start in the historic Metropolitan Handicap (gr. I) at Belmont Park on June 6th. In my opinion, the latter race has the potential to propel Shared Belief into the stratosphere of true greats, as the competition is bound to be fierce—Palace Malice, Private Zone, and Honor Code could definitely be among the other starters—and the one-mile distance will be a powerful test of Shared Belief’s versatility. Should he triumph, his record would be stellar—six grade I wins, an Eclipse award, victories in the Metropolitan, Santa Anita Handicap, and Pacific Classic… and his subsequent accomplishments, which could be numerous since he is a gelding, could make him a legend in this sport. So having shared my beliefs on Shared Belief, we can now turn our attention to the three major Derby preps that were run on Saturday. First and foremost among them was the San Felipe Stakes (gr. II) (VIDEO) at Santa Anita, in which Bob Baffert’s unbeaten Dortmund brought his record to a perfect 5-for-5 with another impressive victory. After getting off to an excellent start and leading the way through fractions of :23.12, :46.98, and 1:11.30, Dortmund was challenged at the top of the stretch by the talented stakes winner Bolo, who seemed to have the edge in momentum and appeared to briefly take the lead from the heavy favorite. But Dortmund responded gamely, running the fourth quarter-mile in an exceptional :24.21—quicker than his previous quarter-mile fraction of :24.32—and drawing away powerfully through a final sixteenth in :06.14 to win by 1 ¼ lengths over the late-running Prospect Park. Really, there’s very little to dislike about Dortmund, except for the fact that he doesn’t seem to possess a quick turn-of-foot or instant acceleration. I made this comment when he won an allowance race at Churchill Downs last November, and I made it again when he won the Robert B. Lewis Stakes (gr. II), and I think it’s something to keep in mind as Dortmund progresses toward the Kentucky Derby. In each of his last two starts, he has appeared beaten at the top of the stretch, only to find more and reclaim the lead late in the race. I believe the reason for this is that Dortmund is unable to match the acceleration of his rivals on the final turn and entering the homestretch, which gives his rivals a temporary advantage, but Dortmund’s ability to maintain a solid pace in the final furlong is what secures him the victory. Although his pedigree suggests that ten furlongs could be a bit beyond his best distance, in my opinion, the manner in which Dortmund has been winning his races suggests that he possesses remarkable stamina and can simply out-grind his opponents to the finish line. If this is indeed the case, Dortmund should only grow more dominant as the distances of his races increase, and that’s a scary thought for his rivals. The only concern is that his lack of a quick turn-of-foot could be an issue if he runs into traffic in the Kentucky Derby, as he might not be able to recover in time if he gets boxed in on the final turn or cannot get a clear run to bring his stamina into play. In my opinion, the ideal trip for Dortmund in the Derby would be similar to the trip enjoyed by Big Brown in 2008—an outside stalking trip in which Dortmund can utilize his strengths without having to worry about traffic. Another eye-catching performance on Saturday was turned in by Todd Pletcher’s Carpe Diem, who returned from a lengthy layoff to win the Tampa Bay Derby (gr. II) (VIDEO) at Tampa Bay Downs in decisive fashion. Granted, the field he beat wasn’t the toughest, and Carpe Diem did benefit from the fact that Sam F. Davis Stakes (gr. III) winner Ocean Knight failed to fire and was beaten nearly thirty lengths. But from a visual and time perspective, Carpe Diem’s performance was exceptional. Making his first start since finishing second in the Breeders’ Cup Juvenile (gr. I), Carpe Diem showed no signs of rust while tracking quick fractions of :23.10, :46.65, and 1:11.35, and when the time came to put the race away, Carpe Diem responded with a burst of speed that carried him well clear of Ami’s Flatter and Divining Rod to win by five lengths in the time of 1:43.60. On the surface, the time doesn’t appear to be very quick, but keep in mind that Tampa Bay Downs is not a very fast racetrack—the stakes record for the Tampa Bay Derby is just 1:43.11 set by Street Sense in 2007, and 2010 Kentucky Derby winner Super Saver finished third in a Tampa Bay Derby that was timed in 1:44.31. Considering that Carpe Diem was coming off a layoff, I was very impressed with his effort on Saturday, and having secured 50 Kentucky Derby qualification points, he can now progress to the Blue Grass Stakes (gr. I) at Keeneland without the pressure of needing to earn more points to qualify to the Derby. This two-prep approach should set up Carpe Diem for a peak effort on the first Saturday in May, and I believe this colt may be one of the best prospects Todd Pletcher has ever had for winning the Run for the Roses. At Aqueduct, El Kabeir rebounded from a defeat in the Withers Stakes (gr. III) to score a dominating 2 ¾-length victory in the Gotham Stakes (gr. III) (VIDEO). Visually, this performance was very impressive: El Kabeir found himself a dozen lengths off the early lead, an awkward place for a horse that is used to running on or near the lead, yet was not affected in the least by the change in running style and the mud being kicked in his face. Bit by bit, El Kabeir advanced through the field as the race progressed, then shifted outside at the top of the stretch and drew off decisively to win. However, it should be noted that the pace of the race really benefitted El Kabeir, as the first half-mile was timed in a fast :46.63 and the second half-mile in a slow :52.26. Additionally, the final time of 1:45.56 translated to a Beyer speed figure of just 89. Again, I give El Kabeir a ton of credit for changing his running style so dramatically and still winning, but the waters will get deeper from here on out, and I’m not sure that El Kabeir will be able to handle the out-of-town shippers that will surely arrive for the Wood Memorial on April 4th. Before wrapping up this post, I would like to briefly mention that lost in the shuffle of Saturday’s action was an impressive performance by Todd Pletcher’s Materiality in the nine-furlong Islamorada Handicap (VIDEO) on March 6th at Gulfstream. The son of Afleet Alex tracked his stablemate Stanford through modest early fractions, then drew off through a fourth quarter-mile in :24.69 and a final furlong in :12.95 to win by 5 ¾ lengths in the impressive final time of 1:49.32. That was good enough for a Beyer speed figure of 104, which suggests that Materiality—who is now unbeaten in two starts—might be a very serious contender for one of the major Derby preps in late March or early April. All told, it was a terrific weekend of racing! Which horses impressed you the most? 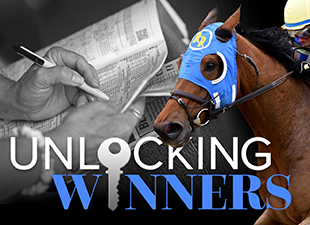 If you enjoy my reports of morning workouts, stakes nominations, race results, and breaking news in the comments sections of my "Unlocking Winners" blog posts, you can now follow me on Twitter (@J_Keelerman) for even more updates!